Articles about "Harga dan Spesifikasi Ponsel Vitell V810" in this website is free. Read our reviews for "Harga dan Spesifikasi Ponsel Vitell V810", cellphone price, handphone specs, features and find more latest Cellphone specs and reviews. Harga dan Spesifikasi Vitell V810-Here is a phone from Vitell Mobile that support triple SIM Card, Vitell V810. 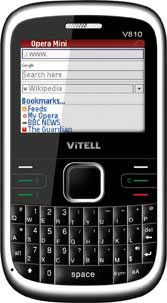 Vitell V810 provides three SIM Card, GSM-GSM-CDMA just like HT-G78 Link. Not only that, Vitell V810 also can be used as Modem GSM. Online applications also has been prepared by the gadget such as Facebook, eBuddy, Operamini, etc. And not forget the gadget that cost about 900,000 Rupiah is equipped with camera 1.3 Megapixel.